Twenty years ago, Barnard’s Arthur Ross Greenhouse was dedicated as a state-of-the-art plant growth facility for the Department of Biological Sciences. Built on the roof of Milbank Hall, it replaced the original greenhouse constructed in 1928 as a laboratory for Professor of Botany Edmund W. Sinnott, who taught at Barnard from 1928 to 1940 and performed studies on the developmental genetics of squash. Today, the 3,400 square foot greenhouse is open to the Barnard and Columbia communities and houses a conservatory, which is home to the collection that faculty use to teach students. The greenhouse is overseen by Ann Whitney Olin Professor of Biology Hilary Callahan, who researches the life cycle of plants. She often works with the genomic model Arabidopsis thaliana, the "fruit fly of botany," to study plant evolution. Callahan receives funding from the National Science Foundation and is teaching a new course, The Global Power of Botany, which is part of Barnard Teaches. Callahan will also serve as the next president of Black Rock Forest Consortium, making her the first woman to do so. To celebrate the twentieth anniversary, Callahan and Greenhouse Coordinator Nicholas Gershberg discuss what makes the greenhouse one of the most unusual rooftop gardens in the city. (Gershberg also consults and advises student leaders of Barnard’s new community garden, located in the Quad, on all things plant-related.) They also offer tips and tricks for how to “shower” a plant. Check out the “Get to Know a Plant” slideshow for more information. What makes the Arthur Ross Greenhouse such a commodity on campus and different from other college greenhouses? A campus greenhouse is emblematic of a commitment to botany and science. For nine decades, research-active greenhouses have occupied Milbank's roof, with the most recent being our 20-year-old Arthur Ross Greenhouse. This facility supports the education of women and the research projects done by women. It also houses fantastically diverse plants from almost every continent and biome. This living collection supports STEM disciplines like biology, chemistry, and environmental science, as well as anthropology and ethnobotany, political science and biogeography, economic botany, education, and history. And we welcome collaborations with artists and writers pursuing inspiration or themes from nature. We support the Foundations curriculum. Increasingly, we're also dovetailing our greenhouse resources and green expertise with campus-wide efforts to achieve sustainability locally, and to understand plant-environment interactions on large and global scales. The greenhouse occupies more than 2,100 square feet under glass. 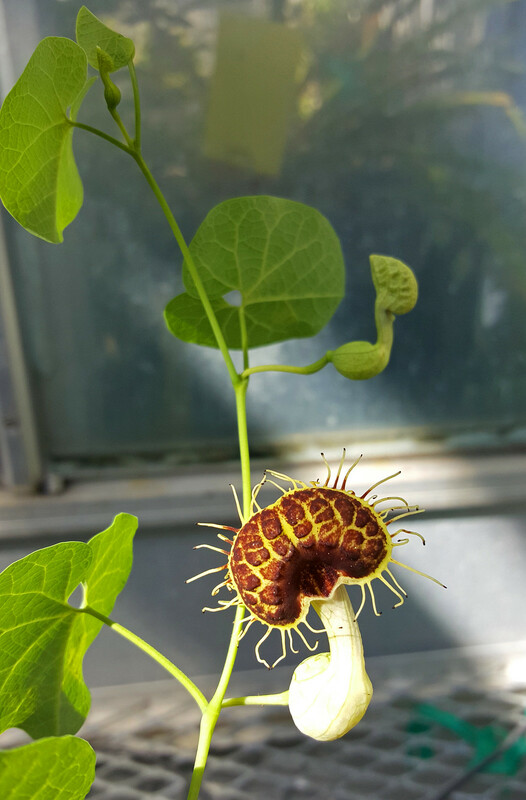 What are some of the strangest plants in the greenhouse, and how do you care for them? We grow and showcase more than 450 species of plants, emphasizing those of cultural, medicinal, or culinary importance, or those with interesting adaptations to extreme environments. Our collection of plants from arid habitats is especially extensive and includes specimens that have beautiful or strange morphology, and gorgeous floral displays when in bloom. Some plants interact fascinatingly with animals. A great example is our "ant-plant" species, whose stems develop intricately hollow structures in their wood. In nature, these are occupied by ant colonies—not yet something we do in our facility! Insects are also lured by our Venus fly traps and other carnivorous plants that actively absorb nitrogen from these tiny corpses. Speaking of corpses, we're proud of our corpse-flower. Its scientific name is Amorphophallus titanum or titan arum. Over the last few years, it has annually transformed from an invisible underground storage organ into an enormous ten-foot tall leaf, in only six weeks! After this big event late last summer, starches from the leaf got re-absorbed into the storage system, which weighed in at nearly ten kilos. One of these years, we anticipate a twelve- to fifteen-foot-tall bloom—the world's largest floral display. It will be accompanied by an astonishingly bad smell. We'll definitely celebrate when this happens. What advice would you offer students who would like to get a plant for their dorm room? Whatever you do, don't try to grow a corpse flower at home! But seriously, a commitment to taking care of a living thing is paramount, as is awareness of the indoor environment. Choices should match up with a room's infrastructure. What is the heating system? Where are the windows? Dim or shady views are great for plants from subtropical places that naturally tolerate growing in the shade of taller trees. Think pothos or philodendrons, or my personal favorites: crotons. You can gradually build a mini-collection of these, even choosing varieties with unusual pigmentation. If windows face south or the river, or if the heating is dry, choose desert-native succulents like jade plants, sansevierias, or aloes. With good lighting and nurturing, plus re-potting, these plants can grow big enough to bloom, usually in winter and sometimes quite fragrantly. In the greenhouse and elsewhere, plants sometimes get too big for their pots and space. Take a cutting and start a "daughter plant;" give the big mama away to someone with more space. Also, be aware that plants can get infested by insects or other pests. Don't try to pawn these off on the greenhouse or anyone else, please! Sometimes, composting is the only solution. But first, remove and discard dead or damaged leaves, and douse regularly with a spray bottle or even a quick shower. I periodically drag my own houseplants under a shower of tepid water for a minute every month or two; it keeps plants healthy and dust-free. Do remember, that over-watering is one of the fastest ways to kill houseplants. Whether or not you are growing your own specimens, the Ross Greenhouse welcomes your visits. Regular drop-in hours are held every Wednesday 1–3 p.m. Ring the bell on the fourth floor of Milbank, and our full-time greenhouse guru, Nicholas Gershberg, or a student assistant, will buzz you in, show you around, and answer questions.